Christmas seems to have snuck up on me this year; I don’t have a tree, I’ve only purchased a couple of presents so far and I’ve just started listening to Christmas carols. To make up for lost time, I spent this morning in my mum’s kitchen covered in coconut as we whipped up batches of rum balls and brandy, ginger and macadamia nut balls to share with friends. The recipes for each are written in my mum’s recipe book, their corners marked from frequent use and ingredients splashed across their pages. And while they are undeniably delicious, making them is often time consuming and costly—and very sticky. Which is why my go-to sweet treat this Christmas is Chocolate Crackle Puddings which are quick, easy and fun for children and adults alike! I found this recipe on Taste.com.au. 1. Line ten 125ml (1/2-cup) capacity muffin pans with paper cases. Place the milk chocolate and butter in a large heatproof bowl over a saucepan half-filled with simmering water (make sure the bowl doesn’t touch the water). Stir with a metal spoon until the chocolate melts and the mixture is smooth. 2. Stir in the coco pops. Divide among prepared pans, mould into a dome shape. place in fridge for 2 hours or until firm. 3. Place the white chocolate in a small heatproof bowl over a saucepan half-filled with simmering water (make sure the bowl doesn’t touch the water). Stir with a metal spoon until the chocolate melts and is smooth. 4. Spoon a little white chocolate over each pudding and top with a Jaffa. Set aside until set. I did deviate from this recipe slightly—I prefer to melt the chocolate in the microwave. And if you’re not into the choc-orange flavor of the Jaffas, use red m&ms or smarties. These also make an ideal snack to leave out for Santa! This post is part of the Sweet Adventures Blog Hop. 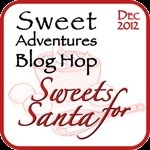 Thanks to Christina from the Hungry Australian blog for hosting the Sweets for Santa blog hop this month. To join the Sweets for Santa blog hop, click here. 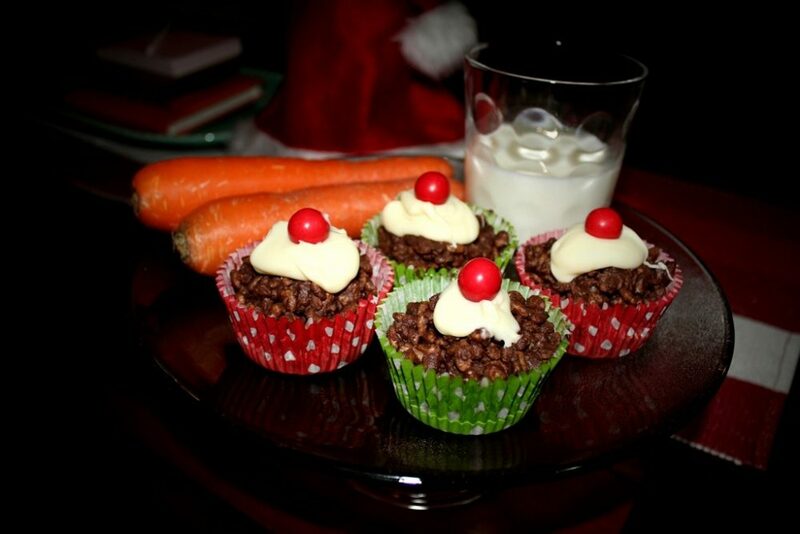 What a great recipe – simple but tasty and so festive looking. My kids are going to love these! Thanks for joining this hop. I hope they were a success with the kids! Loved the hop—I’ll be back for more. Very cute – love a quick and easy Christmas recipe 🙂 Thanks for joining the hop! Thank you. I love the hop idea and I’ll be back for more!